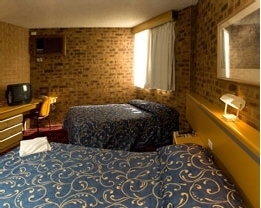 Marco Polo Motor Inn offers budget 3 1/2 star accommodation conveniently located half way between Sydney City CBD and Olympic Park at Homebush (the site of the 2000 Olympic Games and Telstra Stadium) which is 6 kms in each direction. City buses pass outside the door every 10 minutes. 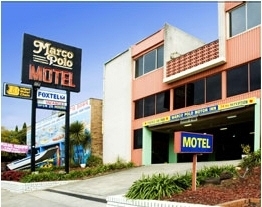 Marco Polo Motel is also a short walk (400 metres) to Summer Hill Railway Station-leave the car at the motel and avoid city traffic. 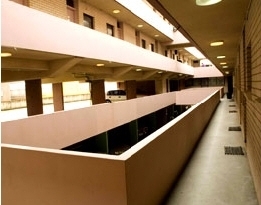 We offer free security parking, free wireless broadband. The building is security building. A few minutes away and you will find several of Sydney's most famous suburban shopping centres- Leichhardt, a centre of Italian cafes, restaurants and boutiques Ashfield, known for its Szechuan Chinese Cruisine and Marrickville, with its Greek Lebanese communities. Each centre also has a large shopping mall. Catch the train at Summer Hill Railway Station and travel direct to Circular Quay and city circle train stations. For country visitors, Marco Polo Motor Inn is also close to Concord, R.P.A. and Masonic Hospitals and to the State Sports Centre, Canterbury Racecourse and conference centre, Star City Casino and Darling Harbour, theatres and museums. Parramatta Road is straight down the road to Circular Quay where it becomes George Street. Marco Polo has 49 reverse cycle airconditioned rooms comfortably furnished, spacious and soundproofed to ensure you can enjoy a restful night's sleep. All rooms have reverse cycle airconditioning, tea and coffee making facilities, toaster, mini fridge, clock radio, telephone (STD and ISD) with internet access, hair dryer, iron and ironing board, microwave, remote control colour TV with free to air channels plus complimentary Foxtel (Foxsport 1 & 2, Showtime, Movie Greats, Sky News and Fox 8-you can also request Discovery, Nickelodian and UK TV), video & DVD on request, crockery/cutlery on request. 24 hour check-in, kiosk (licensed), courtesy bus to deliver you to and from the Western Suburbs Leagues Club, rooftop city skyline views. For your convenience Reception is open 24 hours per day. Our receptionist will be glad to assist with advising on how to get around Sydney and where to find local attractions. There is a guest laundry on the ground floor with a coin operated washing machine and dryer. Washing powder is available at Reception. 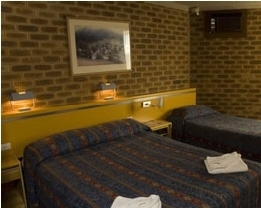 Rooms range from single, twin, queen bed rooms and family rooms for up to 5 people. Non Smoking rooms are available. Continental or hot cooked breakfasts are available daily from 6.00am to 8.30am. Takeaway meals can be delivered to your motel room. Ask Reception for a variety of menus. Marco Polo is fully licensed. 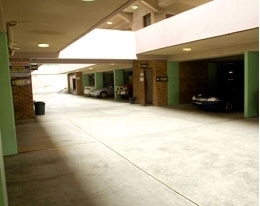 Marco Polo Motor Inn has free undercover parking on the ground and first floors. You are welcome to leave your car here during your stay while you explore the city. We have a 2.4 metre clearance. Reception is open 24 hours a day. Snacks, drinks, fresh milk and newspapers are available at the front office. Coach Tours/ Group Bookings are welcome. Conferences, functions and weddings are welcome. We have a 50 seat licensed restaurant and function room available for group bookings. This room has reverse cycle airconditioning, tea and coffee making facilities, toaster, fridge, clock radio, hairdryer, iron and ironing board, telephone (STD and ISD) also includes 12 foxtel channels (Free) , DVD (on request), microwave, large refrigerator, wireless internet and security parking (undercover), air conditioning/heating, en-suite bathroom (renovated), guest laundry, refreshments. Trains (400 metres) wallk. 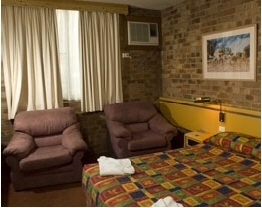 This room has reverse cycle airconditioning, tea and coffee making facilities, toaster, fridge, clock radio, hairdryer, iron and ironing board, telephone (STD and ISD) also includes foxtel, microwave, wirless internet and undercover parking. Photocopy and fax facilities are available. ISD/STD direct dial telephones with voice mail functions are in each room with access to the internet. We have an Internet Kiosk at Reception and public phones. Check in is any time 24 hours a day. We are happy to greet you any time. Should you require a later check out time please discuss this with Reception on arrival. Charges may apply depending on how late check out is. Free undercover off street parking is available for all rooms. You may arrange to park your car at the motel all day long without charge and enjoy the sights of Sydney by public transport. Parking has a 2.4 metre clearance. We are situated near the corner of Parramatta Road and Sloane Street, Summer Hill. From the city we are 6kms on the left hand side just past Leichhardt. We are just past Dover Street, Summer Hill before you reach Sloane Street. Driving from Parramatta/Strathfield or Ashfield we are on the right hand side of Parramatta Road. Because there is no right hand turn into the Motel you need to turn right into Liverpool Road/Hume Highway (or follow the Canberra/Ashfield signs) and then turn next left into Kensington Street, through the first round-about and next left into Dover Street, and then left into Parramatta Road and left again into the Motel. We are 11kms from the Airport. A taxi fare is approximately $22-$27. Alternatively take the train to Central Railway Station and then a train to Summer Hill Railway Station. We are 400 metres from the train station. Walk to Parramatta Road down Sloane Street, turn right into Parramatta Road and we are one building from the corner. (Note take the right hand side exit at Summer Hill Railway Station). The train from Summer Hill Railway station goes to the city circle. We are only 400 metres from the Railway Station. Town Hall and they leave every 10 minutes. To return to the Motel catch the bus across the road from Town Hall - numbers 480, 483 and 461. Obtain a daily or 2-day bus, rail, ferry pass etc. 6kms to Sydney City CBD - buses 480,483,461 - buses depart every 10 minutes. 400 metres to Summer Hill Railway Station. 1.5kms to Norton Street restaurants and cafes in Leichhardt (Little Italy). 6kms to Telstra Stadium at Homebush - easily accessed by train from Summer Hill Railway Station. 6kms to Sydney Showground at Homebush - easily accessed by train. 5kms to Strathfield by bus 480, 483 or train. 6kms to Darling Harbour accessed by train or bus- 480,483 or 461. 4kms to Harold Park Racecourse. 4kms to Wentworth Park Racecourse. 11kms to Airport - 20 minutes by taxi - approximate cost $22-$27 or go by train. 4kms to Sydney University - bus 480,483 or 461 or train. 4kms to Footbridge Theatre - bus 480,483 or 461 or train. 5kms to Flemington Market by bus or train. Luna Park - take a train to Milson Point.